Hence, adjuvant medications causing vasodilation have been suggested to be beneficial in women with thin endometrium. Several agents such as antithrombotic agents, aspirin,  and heparin have been evaluated by several groups. Heparin was found to improve pregnancy rates among women with thrombophilia and recurrent abortions. Others included L-arginine, Vitamin E, nitrates, sildenafil, estrogen, pentoxifylline, tocopherol, and intrauterine infusion of growth factor such as Granulocyte-colony stimulating factor. , Sildenafil, a phosphodiesterase 5 (PDE-5) inhibitor is now one of the standard treatments for erectile dysfunction (ED) since decades. Beyond its urological scope, new therapeutic applications are being explored because of its vasodilatory property. Hence, here is an attempt to review the effect of sildenafil on the EM, which increases the pregnancy outcome, i.e. its utility in the management of female infertility. Chemical formula - C 22 H 30 N 6 O 4 S.
Nitric oxide causes smooth muscle relaxation by generating intracellular cyclic guanosine monophosphate (cGMP) by stimulating the enzyme guanylate cyclase. cGMP promotes dephosphorylation of myosin light chain kinase, thereby interfering with myosin interaction with actin, leading to smooth muscle relaxation and increase in blood flow. Sildenafil being a selective PDE5 isoenzyme inhibitor enhances the effect of nitric oxide by inhibiting PDE5, which is responsible for degradation of cGMP [Figure 1]. Nitric oxide synthase isoforms have been identified in the vascular muscles of both human endometrium and myometrium. With the use of sildenafil, cGMP remains elevated, which leads to vascular relaxation and increased blood flow to the endometrium. A search was conducted using PUBMED, SCOPUS, and COCHRANE database and focused on peer-reviewed, randomized controlled trials, and observational studies using the keywords: "Sildenafil," "endometrium," "endometrial thickness," "implantation," and "In vitro fertilization" [represented in [Figure 2]. We mainly focused on the effect of sildenafil on EM. All references were scanned from identified articles for additional relevant information. After all the data had been extracted, a table was constructed with respect to first author, study design, patient settings, study groups, outcomes, and conclusion [Table 1]. Sildenafil acts as a specific PDE-5 inhibitor, hence augments the vasodilatory effects of nitric oxide by preventing the degradation of cGMP, which leads to increase uterine blood flow and thicker endometrium. Alternatively, another study suggested that sildenafil may have an effect on vasoactive cytokines that regulate endometrial development or implantation. They found that sildenafil increases uterine receptivity by the development of spiral arteries and increasing uterine arterial blood flow. They recommended the routine use of oral sildenafil citrate in patients with a previous failure of assisted reproduction technology cycles due to poor EM. A study failed to demonstrate the beneficial effect of sildenafil on thin endometrium, has been reported in women treated with estrogen and sildenafil citrate. EM was compared between the groups. Neither vaginal estrogen nor sildenafil significantly improved EM or blood flow in the subsequent frozen embryo transfer (ET) cycle. Thus, the use of sildenafil cannot be expected to help all patients with a thin endometrial lining. Women with intractable damage to the basal endometrium may be less likely to respond to increased uterine blood flow. Response to sildenafil is also predicated on an adequate serum estrogen level. Luteal supplementation of sildenafil citrate (oral or vaginal) and oral estradiol valerate can be used for improving the EM, therefore can be used as an adjuvant therapy in patients with thin endometrium. 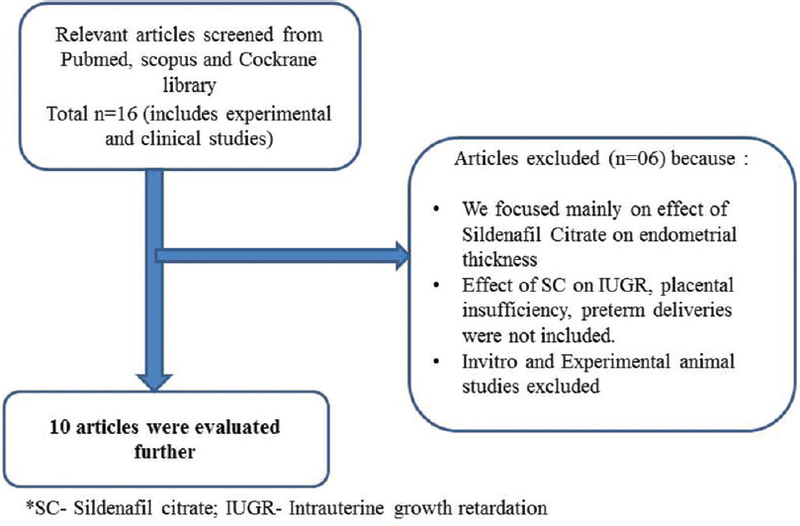 Sildenafil when compared to estradiol valerate has a better outcome in terms of uterine receptivity, endometrial vascularity, and marginally increased pregnancy outcome in patients undergoing IUI or IVF-ET. Furthermore, participants tolerated well vaginal sildenafil with minimal adverse effects. Future studies to evaluate the sildenafil effect on fetal outcome in pregnant women and large sample size clinical trials are needed. Kovacs P, Matyas S, Boda K, Kaali SG. The effect of endometrial thickness on IVF/ICSI outcome. Hum Reprod 2003;18:2337-41. Miwa I, Tamura H, Takasaki A, Yamagata Y, Shimamura K, Sugino N. Pathophysiologic features of "thin" endometrium. Fertil Steril 2009;91:998-1004. Padubidri VG, Daftary SN. Normal Histology. In: Howkins and Bourne ′Shaw′s textbook of gynaecology′. 13 th ed., Ch. 2. New Delhi: Elsevier publishers; 2004. p. 30-32. Sugino N, Suzuki T, Sakata A, Miwa I, Asada H, Taketani T, et al. Angiogenesis in the human corpus luteum: Changes in expression of angiopoietins in the corpus luteum throughout the menstrual cycle and in early pregnancy. J Clin Endocrinol Metab 2005;90:6141-8. Smith SK. Angiogenesis and implantation. Hum Reprod 2000;15 Suppl 6:59-66. Sugino N, Kashida S, Karube-Harada A, Takiguchi S, Kato H. Expression of vascular endothelial growth factor (VEGF) and its receptors in human endometrium throughout the menstrual cycle and in early pregnancy. Reproduction 2002;123:379-87. Fahmy AA, El Sokkary M, Sayed S. The value of oral sildenafil in the treatment of female infertility: A randomized clinical trial. Life Sci J 2015;12:78-82. Sher G, Fisch JD. Effect of vaginal sildenafil on the outcome of in vitro fertilization (IVF) after multiple IVF failures attributed to poor endometrial development. Fertil Steril 2002;78:1073-6. Garcia-Velasco JA, Acevedo B, Alvarez C, Alvarez M, Bellver J, Fontes J, et al. Strategies to manage refractory endometrium: State of the art in 2016. Reprod Biomed Online 2016;32:474-89. Matteo M, Cicinelli E, Greco P, Massenzio F, Baldini D, Falagario T, et al. Abnormal pattern of lymphocyte subpopulations in the endometrium of infertile women with chronic endometritis. Am J Reprod Immunol 2009;61:322-9. Hsieh YY, Tsai HD, Chang CC, Lo HY, Chen CL. Low-dose aspirin for infertile women with thin endometrium receiving intrauterine insemination: A prospective, randomized study. J Assist Reprod Genet 2000;17:174-7. Rubinstein M, Marazzi A, Polak de Fried E. Low-dose aspirin treatment improves ovarian responsiveness, uterine and ovarian blood flow velocity, implantation and pregnancy rates in patients undergoing in vitro fertilization: Prospective, randomized, double-blind placebo-controlled assay. Fertil Steril 2000;73:1069-71. Senturk LM, Erel CT. Thin endometrium in assisted reproductive technology. Curr Opin Obstet Gynecol 2008;20:221-8. Lebovitz O, Orvieto R. Treating patients with "thin" endometrium - An ongoing challenge. Gynecol Endocrinol 2014;30:409-14. Boolell M, Gepi-Attee S, Gingell JC, Allen MJ. Sildenafil, a novel effective oral therapy for male erectile dysfunction. Br J Urol 1996;78:257-61. Terrett NK, Bell AS, Brown D, Elllis P. Sildenafil (Viagra), a potent and selective inhibitor of type 5 cGMP phosphodiesterase with utility for the treatment of male erectile dysfunction. Bioorg Med Chem Lett 1996;6:1819-24. Historical Information on Sildenafil Citrate. FDA. Available from: http://www.fda.gov/Drugs/DrugSafety/PostmarketDrugSafetyInformationforPatientsandProviders/ucm162847.htm. [Last accessed on 2016 Jul 30]. Pubchem - Open Chemistry Database, Sildenafil (Compound Summary). National Center for Biotechnology Information, U.S. National Library of Medicine, 8600 Rockville Pike, Bethesda, MD 20894, USA. Available from: https://www.pubchem.ncbi.nlm.nih.gov/compound/sildenafil. [Last accessed on 2016 Aug 09]. Jackson G, Montorsi P, Cheitlin MD. Cardiovascular safety of sildenafil citrate (Viagra): An updated perspective. Urology 2006;68 3 Suppl: 47-60. Dehghani Firouzabadi R, Davar R, Hojjat F, Mahdavi M. Effect of sildenafil citrate on endometrial preparation and outcome of frozen-thawed embryo transfer cycles: A randomized clinical trial. Iran J Reprod Med 2013;11:151-8. Tripathi KD, editor. Androgens and drugs for erectile dysfunction. In: Text Book of Essentials of Medical Pharmacology. 7 th ed., Ch. 21. New Delhi: Jaypee Publishers; 2013. p. 303-4. 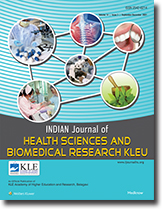 Mangal S, Mehirishi S. To study and compare the effect of vaginal sildenafil and estradiol valerate on endometrial thickness, blood flow and pregnancy rates in infertile women undergoing intrauterine insemination. Int J Reprod Contracept Obstet Gynecol 2016;5:2274-7. Mishra VV, Choudhary S, Bandwal P, Aggarwal R, Agarwal R, Gandhi K. Vaginal sildenafil: Role in improving endometrial blood flow in women undergoing IVF with frozen - Thawed embryo cycles - A study over three cycles. Int J Sci Res 2015;4:292-4. Kim KR, Sun Lee H, Ryu HE, Park CY, Min SH, Park C, et al. 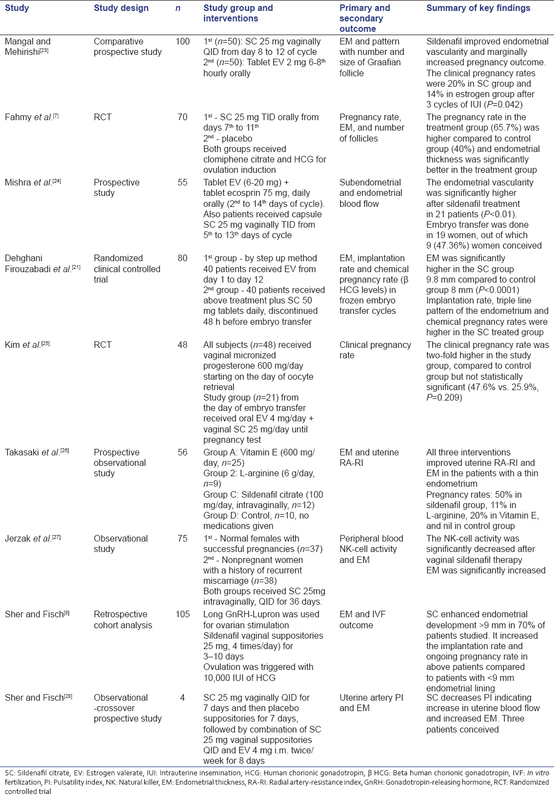 Efficacy of luteal supplementation of vaginal sildenafil and oral estrogen on pregnancy rate following IVF-ET in women with a history of thin endometria: A pilot study. J Womens Med 2010;3:155-8. Takasaki A, Tamura H, Miwa I, Taketani T, Shimamura K, Sugino N. Endometrial growth and uterine blood flow: A pilot study for improving endometrial thickness in the patients with a thin endometrium. Fertil Steril 2010;93:1851-8. Jerzak M, Kniotek M, Mrozek J, Górski A, Baranowski W. Sildenafil citrate decreased natural killer cell activity and enhanced chance of successful pregnancy in women with a history of recurrent miscarriage. Fertil Steril 2008;90:1848-53. Sher G, Fisch JD. Vaginal sildenafil (Viagra): A preliminary report of a novel method to improve uterine artery blood flow and endometrial development in patients undergoing IVF. Hum Reprod 2000;15:806-9. Zoma WD, Baker RS, Clark KE. Effects of combined use of sildenafil citrate (Viagra) and 17beta-estradiol on ovine coronary and uterine hemodynamics. Am J Obstet Gynecol 2004;190:1291-7. Di X, Gennings C, Bear HD, Graham LJ, Sheth CM, White KL Jr., et al. Influence of the phosphodiesterase-5 inhibitor, sildenafil, on sensitivity to chemotherapy in breast tumor cells. Breast Cancer Res Treat 2010;124:349-60. Pyriochou A, Zhou Z, Koika V, Petrou C, Cordopatis P, Sessa WC, et al. The phosphodiesterase 5 inhibitor sildenafil stimulates angiogenesis through a protein kinase G/MAPK pathway. J Cell Physiol 2007;211:197-204. Check JH, Graziano V, Lee G, Nazari A, Choe JK, Dietterich C. Neither sildenafil nor vaginal estradiol improves endometrial thickness in women with thin endometria after taking oral estradiol in graduating dosages. Clin Exp Obstet Gynecol 2004;31:99-102.